Sweat the onions, celery and mushrooms in the butter without browning, until they are nearly tender. Add the veloute sauce. Bring to a simmer and cook until the vegetables are tender, about 15 minutes. Skim the surface if needed. Puree the soup, and then strain through a fine china cap. Return the soup to the stove, and if needed, thin with chicken stock. Bring the soup to a simmer and add the hot cream. Season to taste with salt and white pepper. 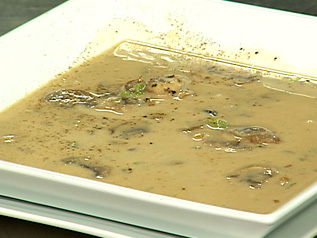 Serve the soup topped with some of the sautéed sliced mushrooms. Courtesy of Austin Cooks, a Culinary Arts program initiative of Austin Community College.